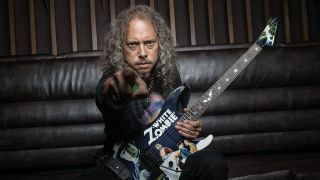 Kirk Hammett is a guitar hero. It’s as simple as that. The Metallica legend owns a sound and style that’s been widening the horizons and flooring the jaws of impressionable youths for 35 years. His passion and personality, flamboyance and finesse, melodic nous and attacking zeal have motivated countless youngsters to pick up a six-string. For Kirk, growing up in California in the late 60s and 70s, his own primary motivator comes as no surprise. Thus inspired, Kirk took up the guitar and formed his first band, which became Exodus in 1979. From an early stage, the teenage guitarist was generating his own material – and writing a piece of heavy metal history in the process. The world was listening. When Exodus started playing their own songs live – Kirk compositions Die By His Hand and Impaler included – it was clear that something explosive was brewing, and that he was helping to shape a sound that would change metal forever. Exodus’s music was inspired by a new generation of metal coming out of Britain, but the Bay Area boys gleefully set about making it faster and more aggressive. Despite the disapproval of family and friends alike, Kirk was making a name for himself as a key player in this burgeoning scene; so much so, in 1983 he was called in at short notice to replace Dave Mustaine in Metallica, underground metal’s hottest band, on the eve of recording Kill ’Em All, underground metal’s hottest debut. An intimidating situation, handled with confidence and maturity by a man barely into his 20s. Alongside James Hetfield’s crunch, Kirk Hammett’s blues-schooled licks and singable leads came to define Metallica’s sound so powerfully that it still seems bizarre to think he was never part of the original plan. And then, of course, there’s what might just be Kirk’s most iconic trait of all: his beloved wah-wah pedal. It became a Hammett trademark that helped make him a lynchpin in the sound that saw Metallica become the biggest band in metal. A sound that has continued to evolve and adapt over the years – and never more controversially than on 2003’s St. Anger, which entirely dropped one of Kirk’s hallmarks – guitar solos. He strongly objected at the time, and his distaste hasn’t mellowed. If the fashion of 2003 was against guitar solos, the fashion of 2018 seems to be against guitars altogether. Asked about the troubles currently facing the good old-fashioned six-string – our conversation takes place the day after Gibson filed for bankruptcy – Kirk sounds more hurt than angry. Although evidence of the guitar’s decline is all around us, there remains a rabid audience who still joyfully obsess over the finer points of each player. They’re counting the days until they can get their teeth into a Kirk solo album… so how about it?